Going the extra mile for your intended parents may form a lasting bond between you. A healthy baby, of course, is the best gift you can give them – but if you want to be extra-nice, personal gifts can go a long way. They need not be expensive; in fact, it’s better for them to be more personal and symbolic. 1. A photo journal of yourself during your pregnancy is an inexpensive gift that would definitely make a good keepsake for the intended parents. Be sure to write little notes along with each picture – “My third week and craving for fruits”, for instance. Ultrasound images of the baby also make fantastic photos for the intended parents. 2. Home-made videos are another great gift suggestion. All you need is a good camera and some video editing software – the software is readily available for free on the internet, and allows you to personalize the videos. Many doctors’ offices can give you ultrasounds of the baby, which you could also include in your video. 3. Baby products. These are inexpensive and not particularly sentimental, but very practical – the intended parents are going to need them! 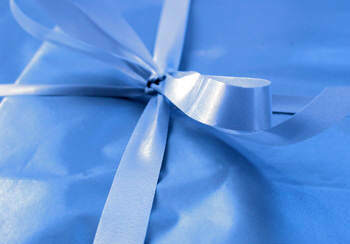 Things like diapers, baby powder, wipes and soaps – one way to present them would be in a gift basket. 4. Baby books. Especially for first-time intended parents, these can come in very handy. Having had your own children, perhaps you can give them something that has helped with previous pregnancies. There’s also the option of giving something they could read to their baby – possibly a book that explains surrogacy to the child! 5. Relaxing candles/aromatherapy. Remember that taking care of a baby isn’t easy, and – as you know from your own experience – the parents do need to unwind every so-often. Gifts like this can come in very handy to assist with that. Think less about the cost of the gift, and more about what the intended parents would need or treasure – some very thoughtful gifts can be very inexpensive. The important thing to remember when giving to your intended parents is, ‘what would mean the most to them?’ And by going the extra mile in this way, they may give you extra consideration should they need a surrogate in the future.